Summer time represents grilling at it's finest, and what could be better than grilled sweet corn along side a nice smoky rack of ribs, chicken, steaks or pork chops. I have gotten pretty darn good at procuring a tasty side of corn for meals and an added plus is the kids love it. I have tried several methods, and they all lend the same sweet delicious results. A little trick an older friend I met back in college, showed me that corn can be steamed perfectly by leaving the husks ON and trimming the wild ends, then microwaving it for about 3 1/2 minutes each. 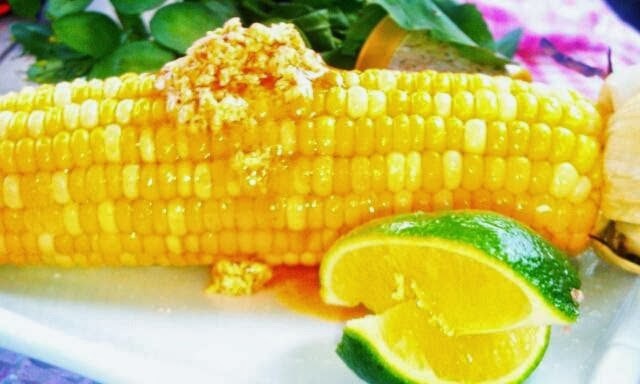 The results were a wonderful, sweet and vibrant piece of corn bursting with flavor. I used the same premise, keeping it in original form to prepare my corn on the grill. One way I prepare it is double wrapping the corn in threes in heavy duty foil and placing it directly over the hottest part of the grill. I let the corn go for about 5 minutes, then I flip it. After another 5 minutes, flip again and so on. I stack the corn also, rotating the packs, so that each packet has about 5 minutes each over the direct heat. This saves on grill space. After the rotation process, enough heat should have been introduced to the corn for it to successfully steam without hassle and turns out wonderfully. Individual packets will be ready in about 15-20 minutes tops! Another way I grill corn is without the foil, dunked in water, husks on, directly over the heat and this cuts the time in half, making sure you turn it frequently to prevent over-drying and burning. 2 parts sauce for every 4 parts butter. Blend until well combined and place in freezer until ready for use. Limes add a bright and zesty flavor element to the corn and other grilled items, so pile it on! Himalayan Pink Salt is the perfect seasoning for grilled corn and grilled foods as a whole!